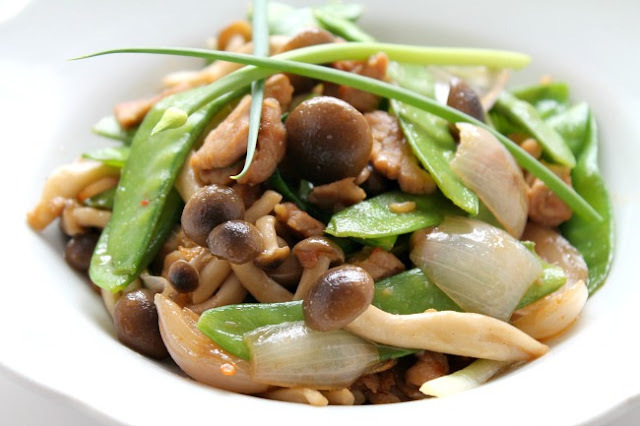 my bare cupboard: Snow peas , mushroom and pork stir-fry "
But then who wouldn't ? In this day and age ? Don't worry , moderation is the key . As long as you won't stuff yourself silly with everything that is deliciously awesome but unhealthy food , you're safe . * Trim and briefly rinse mushroom under running water , drain well ; set aside . 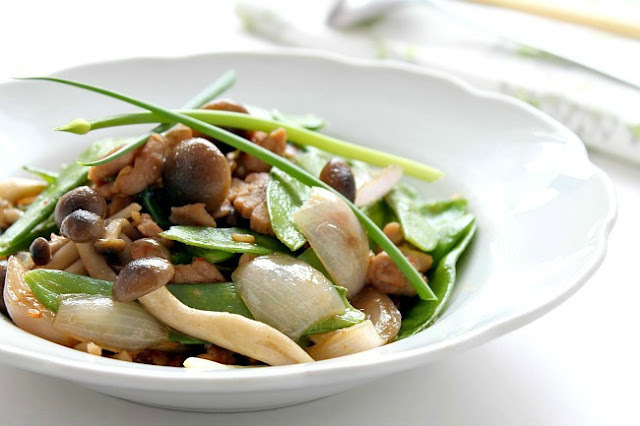 * In a large nonstick pan , pour a little bit oil , add in half of the ginger , stir fry until fragrant then add in the mushroom , cook for about a minute . Transfer to a plate , keep warm . * In the same pan , wipe the surface with kitchen towel , add a little bit oil , put in the shallots , ginger and garlic , stir fry until fragrant , add in the pork , cook for 2 minutes . Add in the snow peas , some salt and chili sauce , stir well to combine , cook for about 30 seconds . Add in the mushroom and pour in 2 tablespoons of water , adjust seasoning . Add in spring onion ,and give it another good stir . Dish up and serve immediately . This post is linked to the blog hop event Little Thumbs Up organized by Zoe of Bake for Happy Kids and Doreen of My Little Favourite DIY . 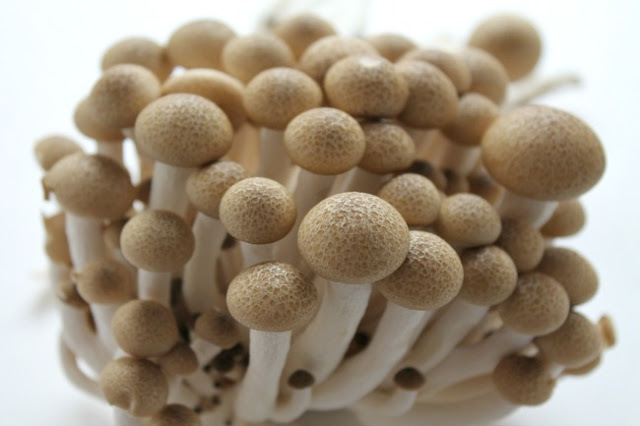 The ingredient for this month is MUSHROOM and hosted by Joyce of Kitchen Flavours . A lovely dish! I love all the ingredients! I'm one of those who do not use any make-up and who does not like shopping UNLESS it is for my kitchen and cooking books for my bookshelf!! Which do not come cheap either! LOL! Thank you for linking this lovely dish to LTU! Yep, it cannot be expensive food because the simple ones contains great flavors too. This is similar to our Chinese style of cooking and its also one of my fav, just that I don't cook pork at home. That said, am sure chicken will be great too. Hi Anne! What a beautiful and healthy dish! What a delicious and simple dish, definitely comfort food for me! The cost of living is increasing at fast pace everywhere and what we need is nutritious and affordable dishes. This looks like a wonderful dish and I checked your steamed egg, too. I sometime microwave eggs but never tried steaming it in wok. Great idea. Very attractive looking mushrooms Anne... we can't get those here:( and I love the snow peas too... Crunch, crunch, crunch!...Mmmm, your dish is just so yum! while you try to stay away from the supermarkets to avoid buying the things that you might not need, i will try to stay away from those cosmetic or beauty related shops, if go in sure will buy something :D i like this kind of homey veggie dish. A nice homey dish you have got there, love the clicks. I guess as long as we dont overindulge we wont overspent from food blogging, besides family gets to eat home cooked dishes although not piping hot because blog always eat first for the photos! This is a very healthy and yummy looking dish! Looks really refreshing!